We are honored to have been invited by Cal Earth Institute, a 503(c)(3) non-profit/charitable foundation, to redesign its website. 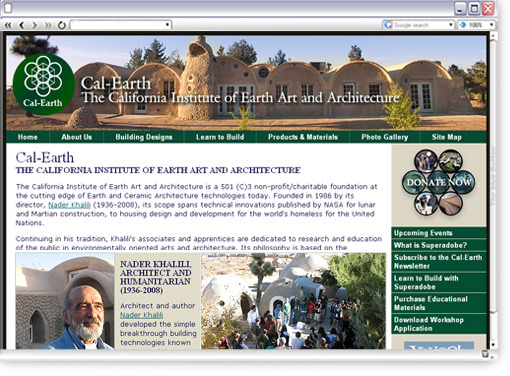 Cal Earth is at the cutting edge of what is called "Earth and Ceramic Architecture technologies" — essentially, making habitable structures out of earth, air and fire built to withstand the vagaries of weather and devastation — and has received accolades and awards from many organizations. 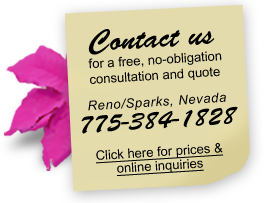 Our assistance consisted of consultation, redesigning the website and ensuring that it is easy to use, and implementing both a shopping cart for Cal-Earth's e-commerce area and a set of forums for online discussion — and teaching Cal-Earth personnel how to update various pages on the website. We continue to lend assistance to Cal-Earth as needed. "We have reached our goal. Fantastic work. This has turned out even better than we imagined. Thank you for stepping up and bringing your A game. I love the web site. It is beautiful and streamlined. Fantastic work!"